Copyright: © 2017 Kaya Z, et al. This is an open access article distributed under the Creative Commons Attribution License, which permits unrestricted use, distribution, and reproduction in any medium, provided the original work is properly cited. Background: Knowledge of pulmonary complications (PCs) in children after hematopoetic stem cell transplantation (allo-HSCT) is limited; most data are from adult studies. Case: We describe a 8 year old girl with high risk acute myeloid leukemia who developed graft versus host disease (GVHD) on Day 20, Cytomegalovirus (CMV) pneumonia on Day 50 and Cryptogenic organizing pneumonia (COP) on Day 170 after allo-HSCT. Discussion: Cryptogenic organizing pneumonia is a rare noninfectious PCs that can be idiopathic or have several risk factors as a secondary causes, such as viral respiratory infections, drugs, GVHD and allo-HSCT. Viral respiratory infections and alloimmune lung syndromes have been reported in a few patients who have undergone transplantation. Pulmonary complications occur in 10% to 25% of children who undergo hematopoietic stem cell transplantation (HSCT) [1-4]. Most such issues are directly related to infection, but noninfectious pulmonary complications are being detected more frequently with advances in modern diagnostic tests [2,3]. Cryptogenic organizing pneumonia (COP) is characterized by noninfectious diffuse interstitial infiltration, restrictive pattern on pulmonary function testing (PFT), and response to steroid after allogeneic hematopoietic stem cell transplantation (allo-HSCT) . Cytomegalovirus (CMV) pneumonia and COP after allogeneic HSCT (allo-HSCT) have only been reported in adults to date [6,7]. We report a pediatric case who developed graft versus host disease (GVHD) on Day 20, CMV pneumonia on Day 50 and COP on Day 170 after allo-HSCT for leukemia. The patient was an 8-year-old girl with high-risk acute myeloid leukemia who underwent allo-HSCT. Her donor was an HLA-identical sibling boy, and peripheral stem cell mobilization yielded a CD34+ count of 5 x 10⁶ CD34+ after conditioning with fractionated total body irradiation (total 1440cGy) and cyclophosphamide. The GVHD prophylaxis consisted of cyclosporin A at a dose of 3 mg/kg and short term methotrexate at a dose of 10 mg/m2 were given. Times to neutrophil and platelet engraftment were 14 and 25 days, respectively. The patient was considered to be at high risk for CMV disease because she and her donor were both CMV-seropositive prior to allo-HSCT; consequently, high-dose acyclovir (1.5 g/m2/day) was administered. Despite receiving cyclosporine, on Day 20 after allo-HSCT the patient developed erythematous skin lesions on her head, neck and trunk and skin biopsy revealed stage III GVHD. Overall grading of skin GVHD was grade III according to the modified Glucksberg score. When these lesions did not resolve with steroid at a dose of 2 mg/kg, the patient was switched from cyclosporine to tacrolimus; however, the lesions only resolved completely once she was changed to sirolimus while tapering the steroid. She was monitored weekly for CMV by polymerase chain reaction (PCR) and was found to be negative. However, on Day 50 after allo-HSCT and while still on high-dose acyclovir prophylaxis, sirolimus and low-dose steroid, she developed persistent fever and severe respiratory symptoms. Multiple cultures of blood, catheter, urine and stool were negative for bacterial, fungal and other pathogens. A chest X-ray showed diffuse interstitial infiltrates, and high-resolution computerized tomography (HRCT) revealed bilateral ground-glass opacities. Positive real-time PCR testing (Roche Diagnostics, Indianapolis, IN) for CMV was 1.2 x 105 copies/mL for blood samples and 0.55 x 105 copies/mL for sputum samples, respectively and the patient was diagnosed with CMV pneumonia . She was started on treatment with ganciclovir 2x5 mg/kg/dose intravenously and steroid therapy was withdrawn. Over 14 days of ganciclovir therapy, she recovered clinically; her CMV burden gradually decreased and she tested negative on Day 21 of treatment. No rebound CMV viremia occurred during her follow-up. Four months after the CMV pneumonia, the patient presented with generalized malaise, dry cough, dyspnea and severe hypoxia (i.e., oxygen saturation 87%) on Day 170. At the time, she was receiving only sirolimus and exhibited no signs of GVHD recurrence after allo-HSCT. A chest X-ray showed diffuse interstitial infiltrates, and ganciclovir was initiated to address CMV reactivation. However, PCR testing for CMV was negative and HRCT showed parenchymal consolidation with peribronchovascular distribution in both lungs (Figure 1), as well as restrictive pattern on PFT (FEV1/FVC ratio 82% of predicted value, FVC 39% of predicted value), which was consistent with COP. Bronchoscopy was not performed because of developing sudden deterioriation with tachypnea, tachycardia and hypoxia requiring assisted ventilation. Her peripheral blood CD3+CD4+ T cell recovery to 0.5x109 cells/L was seen at 6 months of transplantation. The patient was treated with methylprednisolone 1 mg/kg twice daily as suggested by Epler et al. and made a rapid clinically recovery . By the 6 th month of steroid and sirolimus therapy, the widespread lung lesions (parenchymal consolidation and ground-glass opacities) had decreased (Figure 2) and PFTs showed gradual improvement. At the time of writing, the patient was well and had experienced no signs of COP recurrence. 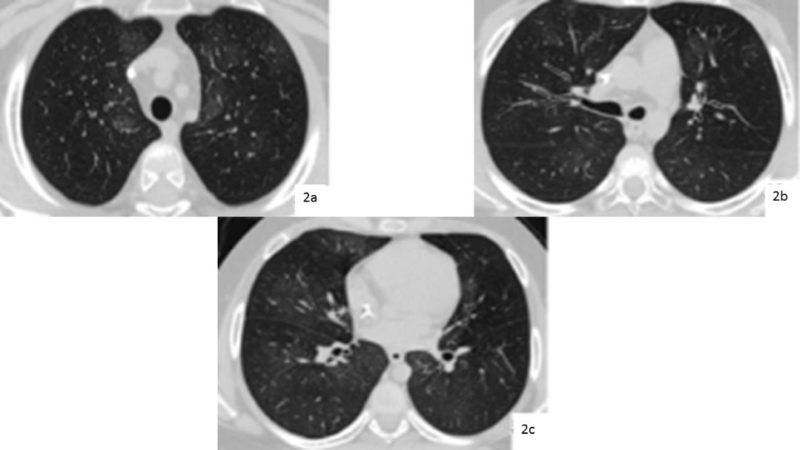 Figure 1: Ground-glass opacities and patches of consolidation in HRCT of the patient’s chest in the expiratory phase before steroid therapy (1a. Upper section 1b. Middle section 1c. Lower section). 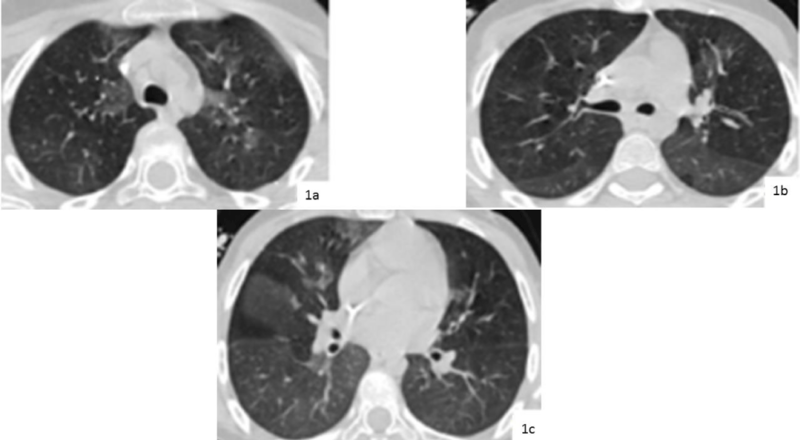 Figure 2: Partial regression of the ground-glass opacities and patchy consolidation in HRCT of the patient’s chest in the expiratory phase after 6 months of steroid therapy (2a. Upper section, 2b. Middle section 2c. Lower section). Cryptogenic organizing pneumonia, previously known as bronchiolitis obliterans organizing pneumonia (BOOP) is a rare noninfectious pulmonary complication that can be idiopathic or have several causes, such as viral respiratory infections, drugs, GVHD, conditioning regimen as a major contributing risk factors after allo-HSCT . There are a few reports of CMV pneumonia and COP in adult patients after HSCT [6,7]; however, development of organizing pneumonia secondary to CMV pneumonia following allo-HSCT for leukemia, as occurred in our case, has not been reported previously in a pediatric series. Recently, it has been noted that viral respiratory infections in the early 100 days post-transplantation period can cause alloimmune lung syndromes (e.g., BOOP) in the late post-transplantation period . A similar association between such CMV infections and alloimmune lung syndromes has been reported in patients taking immunsuppresive medication who have undergone lung or renal transplantation [9,10]. In these cases, previous viral respiratory infections can cause markedly elevated inflammatory cytokines and activated T-cell immunity, leading to alloimmune lung syndromes. Alloimmune lung syndrome has also been reported in patients who have undergone allo-HSCT and i) are either tapering or ceasing immunosupressive therapy for GVHD within 100 days after transplantation, and ii) have a history of viral respiratory infections . Some studies suggest that intense immunosuppression instituted to treat acute GVHD or T-cell depleted transplant procedures may help protect against alloimmune lung syndrome in patients who have undergone allo-HSCT [4, 10-12]. In parallel with these findings, in our pediatric case, BOOP was detected in the 4 months after CMV pneumonia while she was receiving sirolimus for acute GVHD and steroid was being tapered in combination with T cell immune reconstitution. Immunologic abnormalities previously reported as T cell activity response have also been attributed to GVHD-associated BOOP or COP after allo-HSCT . Although BOOP or COP was reported in the setting of acute skin and chronic gut GVHD , no signs of skin GVHD or GVHD recurrence was observed in our case receiving sirolimus when BOOP developed and as it resolved. Similar pulmonary toxicity secondary to sirolimus therapy after allo-HSCT has been reported in only one child . Sirolimus-induced lung disease is reversible with cessation of the drug and administration of steroid whereas our patient’s history of CMV pneumonia and the resolution of symptoms under sirolimus therapy did not meet all of Morelon’s suggested diagnostic criteria for sirolimus-induced lung disease [13,14]. Viral CMV infections, GVHD and sirolimus are secondary causes of organizing pneumonia, it can be difficult to distinguish which one is responsible for COP after allo-HSCT . A literature search for BOOP or COP in patients who have contracted CMV pneumonia after allo-HSCT revealed only two adult cases in which BOOP/COP i) developed secondary to CMV pneumonia after allo-HSCT, and ii) responded to steroid therapy approximately 6 months after transplantation [6, 7]. Based on these considerations, we believe that CMV pneumonia was responsible for the development alloimmune lung syndrome in the form of COP in our case. Although bronchoscopy was not performed, the history of CMV pneumonia, abnormal PFT results and radiological findings, and good response to steroid all support the diagnosis of CMV induced COP. Our experience with this case indicates that transplant physicians should be alert for development of alloimmune lung syndrome in the form of COP after CMV pneumonia in patients who have undergone allo- HSCT. Siddigui MT, Garrity ER, Husain AN. Bronchiolitis obliterans organizing pneumonia like reactions: a nonspesific response or an atypical form of rejection or infections in lung allograft recipients?. Hum Pathol. 1996; 27: 714-719.